This winter has brought an unusual alignment of historical planets in English auction houses. Two paintings by Winston Churchill were sold at Christie’s last month in London, to be followed by the sale of 15 of the British wartime prime minister’s oils on December 17 at Sotheby’s, the largest ever single sale of his works. By coincidence, collectors at a November sale of historical documents and ephemera at Mullock’s auction house in Shropshire could have bid for any of three art works by Adolf Hitler. The fate of the civilized world once hung on the battle of wills between these two men. In a bizarre late echo, a minor legacy of the two is being tested again through a valuation of their artistic efforts. The market price of art is determined as much by the reputation, and therefore the celebrity or notoriety, of the artist as by the inherent merit of that person’s work, and these sales provide extreme examples of that notion. The Sotheby’s lots are part of a much bigger sale of memorabilia from the estate of Churchill’s youngest daughter, the late Mary Soames, that includes his paintings, the 256 lots include his dispatch boxes, photographs, furniture, cigar humidors and every other kind of household item. In Churchill’s case it is particularly difficult to disentangle the value of his work as an artist from the value of his work as the memorabilia of an important statesman. Some rate his painting highly. “Picasso said, ‘That man could have made a fine living if he hadn’t had so many other things to do,’” recalls Churchill’s granddaughter, Edwina Sandys, a successful sculptor and painter based in New York. A picture by Churchill submitted under a pseudonym was accepted for a Royal Academy exhibition, and Churchill’s work was praised by the great art historian Kenneth Clark. Given the current turbulent economic times, the market for Churchill’s paintings seems fairly steady. Of the two sales at Christie’s in London, one canvas went for $229,551, just below the estimated range, while the other came in at the lower end of the range, at $267,157. Artnet.com lists 48 sales in the past 10 years, of which only nine failed to realize the auction houses’ estimates. Sixteen sold within the estimated price range, while 23 sold for more than expected, sometimes far in excess of their estimates. There was, in fact, a boom in Churchill art prices between late 2005 and the summer of 2007, when Sotheby’s sold his Chartwell: Landscape With Sheep for a record 1 million pounds. It had been estimated at just 150,000 to 200,000 pounds. Churchill began painting in 1915, when, after being held responsible for the disastrous Gallipoli campaign intended to break the trench-bound logjam of World War I, he was forced out of government, which induced one of his famous “black dog” depressions. When he showed interest in a cousin’s watercolors, his mother immediately bought him a set of oil paints. 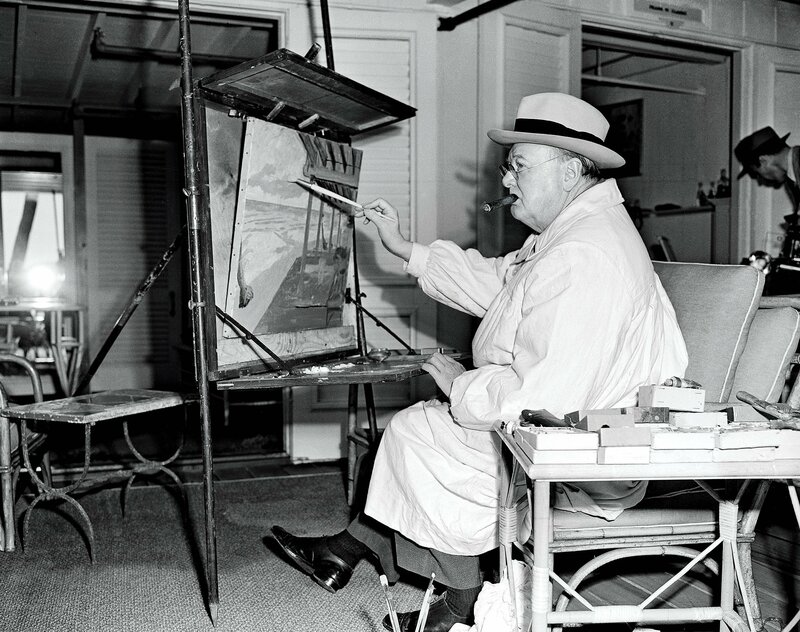 Churchill is known to have completed only one canvas during World War II, but he painted over 500 works between 1915 and the late 1950s. Besides the works repeatedly depicting his beloved Chartwell, most are landscapes from his travels. On his return from abroad, he would show his family and friends his paintings, as people now show their holiday photos. In six of the past 10 years, only two or three pictures have come under the hammer, making 2014, with 18 on sale, an exceptional year. Prices stayed within auction house estimates between 2007 and 2010 (in the wake of the international financial crisis) but have since been picking up. In recent years, a typical canvas has gone for between 100,000 and 500,000 pounds. Historically, Hitler’s paintings have gone for less than a tenth of the price of works by Churchill. 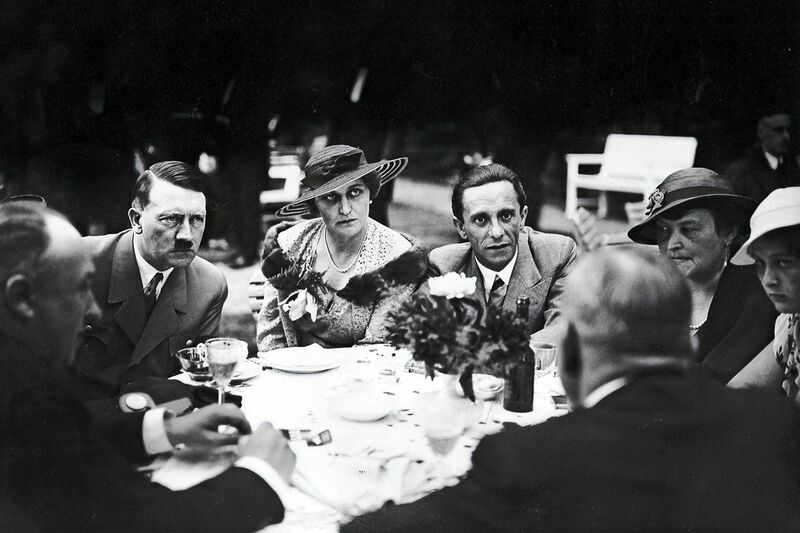 Five years ago, Westwood-Brooke organized a sale that included 13 works by Hitler. All exceeded their estimates, but the most expensive, a rare oil painting by the dictator, still fetched only less than $20,000. 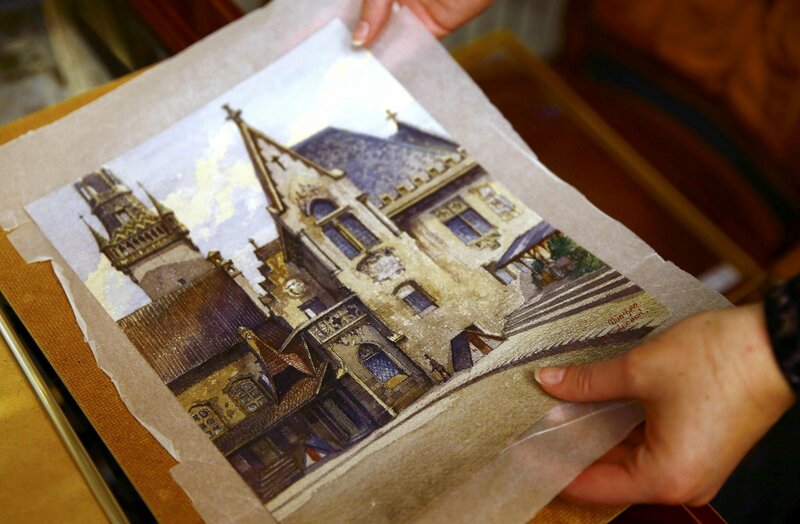 Artnet lists only two sales: A watercolor townscape sold at the Sant’Agostino auction house in Turin, Italy, went for $22,434 in 2009, well below the estimate, while a pencil sketch of a soldier in Pforzheim, Germany, fetched under $40,000 in 2013. Yet recently Westwood-Brooke has detected an increasing interest in Europe in the art of the Third Reich, which he attributes to a shift in attitudes among Germans toward the Nazi period. The Netherlands-based German Art Gallery lists numerous Third Reich paintings. 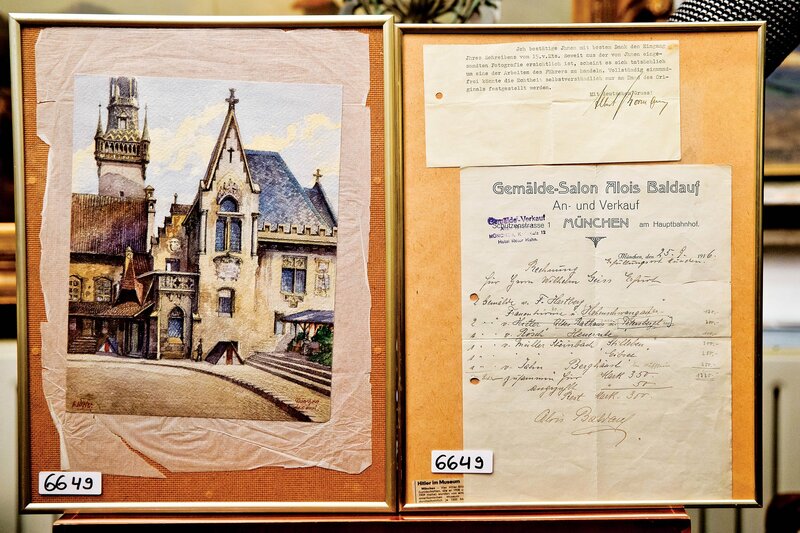 As if to confirm Westwood-Brooke’s point, on November 22 a Nuremberg, Germany, auction house sold a Hitler watercolor of the Old Registry Office in Munich for over $160,000, six times more than the estimated price. Ultimately, it didn’t really matter whether Churchill had genuine talent or not. He painted because he enjoyed it. The contrast with the dismal, impoverished young Austrian, embittered by his failure to become an artist and unable to accept his own mediocrity, could hardly be greater, or more disastrous for world history.